The MIT Scratch Team is exploring ways to make it easier for newcomers to get started creating with coding. We are designing "microworlds"— customized versions of the Scratch editor that contain a small set of blocks for making projects based on a theme. Microworlds offer a more creative entry point to coding. While many introductory coding experiences focus on engaging children in puzzles with one right answer, microworlds provide an open-ended experience, enabling children to explore, experiment, and create, while still providing a more simplified and scaffolded entry point into coding. 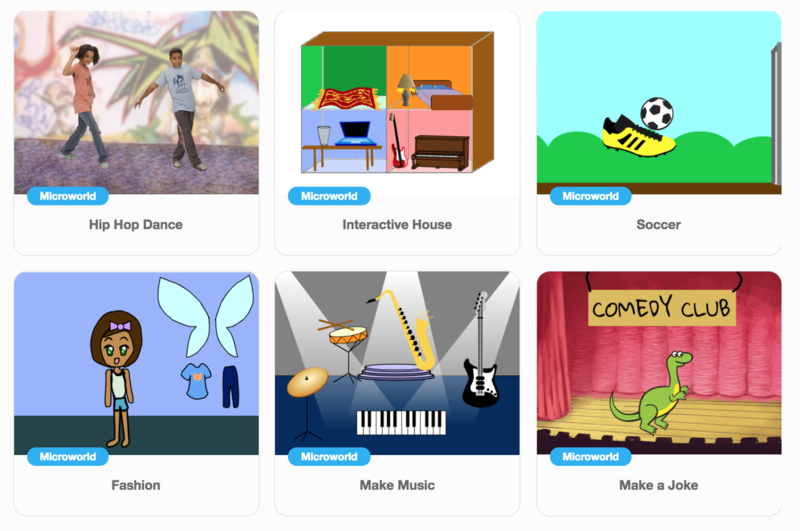 Each microworld includes subset of the Scratch programming blocks that are most relevant and useful for the particular interest area, along with specialized graphical assets related to the interest area. In addition to aligning with a particular interest area, each microworld highlights how coding can enable young people to create projects and express ideas with code. For example, by tinkering with the music microworld, young people can see how they can use code to make musical melodies and beats; by tinkering with the soccer microworld, young people can see how they can use coding to make objects move and start building their own game. The project is part of the Coding for All project. The Coding for All project brings together an interdisciplinary research team from the MIT Media Lab, the Digital Media and Learning Hub at University of California Irvine, and Harvard University’s Berkman Center for Internet and Society to develop new online tools and activities to engage more young people in developing computational fluency, particularly youth from groups currently underrepresented in computing.